The only way to kill off a life-threatening hospital bug effectively is to use cleaners containing bleach, research shows. 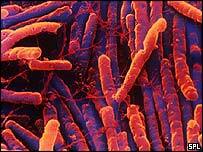 A University of Leeds team found two other cleaners actually seemed to make Clostridium difficile thrive. The bacterium, which causes severe diarrhoea and is particularly dangerous for elderly patients, was linked to just under 1,000 deaths in 2003. The research was presented to a Society for General Microbiology conference. The researchers tested the effect of five cleaning products on different strains of C. difficile. They found all the strains produced more spores when exposed to two chemicals that did not contain bleach. If a bug produces more spores it gives it greater potential to survive for long periods of time in hospitals - raising the chance of it infecting more patients. Researcher Professor Mark Wilcox refused to name the two specific products, but he said they were a commonly-used hospital detergent and a disinfectant containing hydrogen peroxide. He said fact that the other three products contained bleach made them more effective. Professor Wilcox said: "We are trying to understand how some strains of C. difficile can cause such virulent outbreaks in hospitals. "These bacteria can form spores which survive for months or even years in the environment, in spite of hospital cleaning regimens. "We have shown that some commonly used hospital cleaning and disinfectant agents not only fail to kill bacteria, they actually promote spore formation. "The choice of cleaning agent may have a substantial effect on the persistence of C. difficile, and so possibly on the hospital's ability to control infections caused by this important pathogen." Professor Wilcox said it was not always practical to use bleach in a hospital, as it was corrosive, and unpleasant to handle. But he said it should always be used where there was a tangible threat of C. difficile infection. Experts recommend the careful use of antibiotics and isolation of infected patients to stop the spread of the bug. Judy Potter, vice chair of the Infection Contol Nurses Association, said it was recommended that a combination of detergent and bleach products were used to combat C. difficile. She said: "We know that spores can be particularly difficult to eliminate from the environment, and that only chlorine-releasing bleach products are likely to make a difference." In 2004, Department of Health figures showed there were 44,488 cases of the bug in those aged over-65. It hit the headlines after it emerged that more than 300 patients at Stoke Mandeville Hospital in Buckinghamshire had contracted it since 2003.